Does the world really need this? Is it money well spent? We are talking huge money to get this off the ground and maintained. 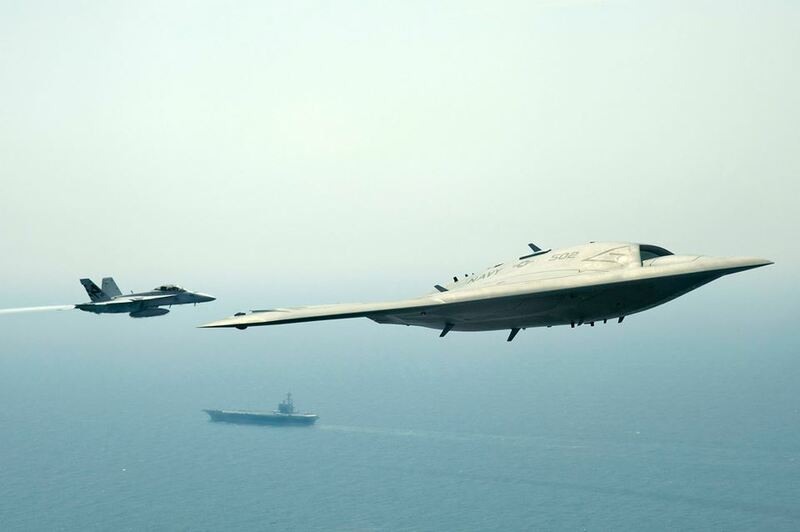 'Northrop Grumman Corp. is pursuing a contract to build a fleet of stealthy, carrier-based drones for the US Navy while it explores commercial uses for the technology, a vice president said. The successful landing last month of an experimental drone aboard the deck of an aircraft carrier was one of the Falls Church, Va.-based company’s many firsts in the history of unmanned aviation, according to Thomas Vice, a corporate vice president and president of Northrop’s aerospace systems unit. “Because of our learning and our experience and investments we have made in this technology, we are very focused on competing and winning the UCLASS program,” he said during a news conference today at the National Press Club, referring to the Navy’s Unmanned Carrier-Launched Airborne Surveillance and Strike effort to build an armed, carrier-based drone fleet. As the US and other countries take steps to let unmanned systems fly in domestic airspace, Northrop is also considering expanding its drone business to include commercial work, from transporting cargo over long distances to mapping ice flows in the Arctic for energy companies, Vice said. Taxpayers are just cattle to fund this war mongering corporation's bottom line? Just listen to this psycho. Maybe that's why automobiles are sooo last century. Grab a bike! It's cost-effective for the country! DO YOUR PART! The US is just a pin cushion for the house of Saud. More pear shaped US, more pear shaped! 'As NATO forces prepare a draw-down of their troop levels in Afghanistan (Syria requests UN Protection from Western 'Aggression'), the Kremlin is increasingly concerned that this heralds a sharp turn by Washington and its Islamist allies towards confrontation with Moscow in Central Asia. Currently, the US has 68,000 US troops in Afghanistan, which it will begin to withdraw in 2014. While the US intends to maintain its military presence well past the 2014 deadline—it is building at least nine permanent military bases in Afghanistan—the troop draw-down is part of a broad shift in US foreign policy. Washington is rapidly moving to war in the Middle East, in an alliance with Al Qaeda-linked terrorist forces against Russia’s ally, Syrian President Bashar al-Assad, as preparation for conflict with Russia and China. Washington’s deepening alignment with Islamist terrorist groups, underscoring the geostrategic interests that drive its fraudulent “war on terror,” is also reflected in its Afghan policy. Together with Afghan President Hamid Karzai, it is holding stepped-up talks with the Taliban to prepare for the troop draw-down in Afghanistan (see: “Washington seeks Taliban deal as Afghanistan casualties mount”). The Russian Vice-Defence Minister Anatoli Antonov recently stated that the withdrawal of NATO troops from Afghanistan was “too hasty.” He announced that Moscow was “striving to strengthen our contingents” in the neighbouring ex-Soviet republics of Tajikistan and Kyrgyzstan ahead of the pull-out. The head of Russia’s GRU military intelligence agency, Igor Sergun, described the situation in Afghanistan as “a serious challenge to international stability”. The Kremlin and the ruling oligarchies in the Central Asian republics of Kyrgyzstan, Uzbekistan and Tajikistan have supported NATO’s bloody occupation of Afghanistan. This will be the general trend in Canada as well. The trend to artificially enhance the need for, and justification of the MIC. Also, prop up all corp's, banks and societal parasites. 'With the evident postponement of an immediate war against Syria, the Obama administration and both Democrats and Republicans in Congress have turned their attention to their main enemy at home, furthering their plans to attack the social programs on which tens of millions of working people in the United States depend on for their health and livelihood. 'The US House of Representatives passed a bill Thursday that would slash food stamp funding by nearly $40 billion over ten years, kicking four million people off the program next year. While the White House and congressional Democrats have said they will not accept the bill in its present form, its passage sets the baseline for a deal by the Democrats, who also favor significant cuts in food aid to the poorest Americans. The food stamp bill would cut $39 billion from the Supplemental Nutrition Assistance Program (SNAP) over ten years. It would force adults between 18 and 50 to either work or attend work training to reapply for benefits, and would also institute drug testing for recipients. The bill would also force food stamp recipients without children to work, train or volunteer for at least 20 hours per week to continue receiving assistance. This would make food stamp recipients the equivalent of indentured servants, forced to work for free in order to eat. 'Perhaps your real life is so rich you don't have time for another. The DOD is developing a parallel to Planet Earth, with billions of individual "nodes" to reflect every man, woman, and child this side of the dividing line between reality and AR. Called the Sentient World Simulation (SWS), it will be a "synthetic mirror of the real world with automated continuous calibration with respect to current real-world information", according to a concept paper for the project. "SWS provides an environment for testing Psychological Operations (PSYOP)," the paper reads, so that military leaders can "develop and test multiple courses of action to anticipate and shape behaviors of adversaries, neutrals, and partners". SWS also replicates financial institutions, utilities, media outlets, and street corner shops. By applying theories of economics and human psychology, its developers believe they can predict how individuals and mobs will respond to various stressors. 'Exuding contempt for the American people, the US Congress failed to pass a continuing resolution to fund federal operations on Monday, shutting down large sections of the government as of 12:01 AM Tuesday. Throughout the day, the Democratic-controlled Senate rejected funding bills sent by the Republican-controlled House of Representatives that included delays in the implementation of the Obama administration’s health care overhaul, which was enacted in 2010 and is due to become fully operational next year. The House, for its part, refused to pass a continuing resolution without such provisions. While so-called Tea Party Republicans in the House played the leading role in blocking a temporary government funding bill, hoping to capitalize on popular opposition to Obama’s reactionary health care “reform,” the White House and congressional Democrats seemed to welcome a shutdown. They calculate that popular anger will focus on the Republicans and the resulting crisis will deepen divisions within the GOP, while providing political cover for the Obama administration to escalate its attacks on social programs and expand its proposed tax windfalls for big business, in line with Republican demands. The White House and the Democratic leadership in the Senate rejected a proposal floated Monday by Senate and House Republicans opposed to a shutdown to extend funding for government operations for a week in order to continue negotiations. At the same time, House Democrats offered to support a funding bill that accepted the Republican spending level of $986 billion, $42 billion less than the Democrats’ proposal of $1.028 trillion. In announcing the offer, Democratic Minority Leader Nancy Pelosi said Senate Majority Leader Harry Reid (Democrat from Nevada) had signaled his support for this move. Although the Republican leadership refused to drop its demand for a delay in the Affordable Care Act (ACA), the Democratic concession prefigured the way in which the government crisis will be used to shift the entire domestic agenda further to the right, increasing cuts in such basic programs as Food Stamps, Medicaid, Medicare and Social Security. The shutdown will have a punishing impact on millions of workers and poor people. At the same time, the government functions considered essential by the corporate-financial elite will be largely unaffected. The uniformed military, the CIA, the National Security Agency, the Department of Homeland Security and the rest of the agencies involved in US imperialist aggression and subversion abroad and domestic spying and repression at home will be virtually unscathed. But over 800,000 of the 2 million federal employees will be furloughed without pay as long as the shutdown lasts, including half of the 800,000 civilian Pentagon workers. Hundreds of thousands more federal employees will be compelled to work without pay. These are workers who have already suffered the consequences of a three-year pay freeze imposed by the Obama administration as well as weeks of unpaid furloughs resulting from the automatic “sequester” cuts proposed in 2011 by the White House, which began to take effect last March. Personal income for federal workers across the country dropped by an average of 0.8 percent in the second quarter of this year. The most vulnerable sections of society will be particularly hard hit. The federal Women, Infant and Children (WIC) program, which provides food for low-income women and children, will shut down. Veterans Administration disability claims will cease to be processed. Who needs this junk? Canada? If your going to get behind anything; helicopters, some heavy lift, Littoral boats, Special Forces and the Super Hornet - otherwise put the wallet away. Italy is becoming a launch pad for America's wars, thanks to your tax dollars. 'The Pentagon has spent the last two decades plowing hundreds of millions of tax dollars into military bases in Italy, turning the country into an increasingly important center for U.S. military power. Especially since the start of the Global War on Terror in 2001, the military has been shifting its European center of gravity south from Germany, where the overwhelming majority of U.S. forces in the region have been stationed since the end of World War II. In the process, the Pentagon has turned the Italian peninsula into a launching pad for future wars in Africa, the Middle East, and beyond. At bases in Naples, Aviano, Sicily, Pisa, and Vicenza, among others, the military has spent more than $2 billion on construction alone since the end of the Cold War — and that figure doesn’t include billions more on classified construction projects and everyday operating and personnel costs. While the number of troops in Germany has fallen from 250,000 when the Soviet Union collapsed to about 50,000 today, the roughly 13,000 U.S. troops (plus 16,000 family members) stationed in Italy match the numbers at the height of the Cold War. That, in turn, means that the percentage of U.S. forces in Europe based in Italy has tripled since 1991 from around 5% to more than 15%. Last month, I had a chance to visit the newest U.S. base in Italy, a three-month-old garrison in Vicenza, near Venice. Home to a rapid reaction intervention force, the 173rd Infantry Brigade Combat Team (Airborne), and the Army’s component of the U.S. Africa Command (AFRICOM), the base extends for a mile, north to south, dwarfing everything else in the small city. In fact, at over 145 acres, the base is almost exactly the size of Washington’s National Mall or the equivalent of around 110 American football fields. The price tag for the base and related construction in a city that already hosted at least six installations: upwards of $600 million since fiscal year 2007. 'Special Operation Command wants a suit its operators can wear that features liquid body armor, built-in computers and offers super human strength. Essentially, the Pentagon wants to outfit its special operators in Iron Man suits. Officials from U.S. Special Operation Command issued a formal request to researchers to help them build this suit the military is calling the Tactical Assault Light Operator Suit (TALOS). The request comes right from the top — Adm. William McRaven, USSOCOM commander. Some of America’s top scientists from labs such as Massachusetts Institute of Technology are pitching in on the project. MIT engineers are working on a liquid body armor made of magnetorheological fluids that “transform from liquid to solid in milliseconds when a magnetic field or electrical current is applied,” according to an Army statement. No wonder our leaders tell us not to worry our little heads about our wars -- just support those troops, go shopping, and keep waving that flag. There is a new normal in America: our government may shut down, but our wars continue. Congress may not be able to pass a budget, but the U.S. military can still launch commando raids in Libya and Somalia, the Afghan War can still be prosecuted, Italy can be garrisoned by American troops (putting the “empire” back in Rome), Africa can be used as an imperial playground (as in the late nineteenth century “ scramble for Africa,” but with the U.S. and China doing the scrambling this time around), and the military-industrial complex can still dominate the world’s arms trade. 'Benefit payments from the US government’s Supplemental Nutrition Assistance Program (SNAP), better known as food stamps, will be slashed drastically on November 1, the first across-the-board cut in food stamp benefits in US history. The cuts will amount to $5 billion per year, and a total of $11 billion through 2016. The average household of three will receive a benefit cut of $29 a month, or $319 per year. The CBPP noted, “The cut is equivalent to about 16 meals a month for a family of three based on the cost of the U.S. Agriculture Department’s ‘Thrifty Food Plan.’” Once the cuts go through, SNAP assistance will amount to less than $1.40 per person per meal, according to the CBPP. One in seven Americans receives food stamp assistance, up from 9 percent of the population in 2008 to nearly 15 percent in 2012. The program helps feed 48 million people, up from 26 million in 2007. The cuts are the result of the expiration of the 2009 Recovery Act’s temporary increase in food stamp assistance, which neither the Democrats nor Republicans proposed seriously proposed to prevent. Over 80 percent of SNAP benefits go to households with incomes below the federal poverty line, an abysmally low $19,530 annually for a family of three, and 40 percent of recipients live in deep poverty, defined as below $9,765 annually for a family of three. The share of food stamp recipients who are working has risen significantly. Nearly one third of SNAP recipients were working in 2010, up from less than 20 percent two decades before. Of those who do not work, the vast majority are disabled, elderly or under age. The number of people who receive food stamps will continue to rise through 2014, according to projections by the Congressional Budget Office. Related: Ohio Replacement Submarine Starts Early Construction (The Navy’s Ohio Replacement Program is being worked on by Electric Boat, a division of General Dynamics, under a five-year, $1.85 billion deal. Like other high-priority programs in DoD, the ORP effort faces substantial financial challenges due to the current fiscal environment, sequestration and the lack of a fiscal year 2014 budget. The "money" for quantitative easing just HAS to come from somewhere, don'tcha know?